Wet markets are where you buy fresh veggies, right? Why not buy your bok choy and your bean sprouts with a bit of backing music, just like the canned music at the supermarket? My wet market now has a new attraction every Saturday morning - The Karaoke Recycler. We first noticed him last week, belting out an accompaniment to a Chinese pop song blaring distordedly from his battery-operated speaker-on-wheels. It was his khaki green sneakers that gave his real profession away - they are compulsory footwear for the Recycling Guys of Shanghai, trundling along on their tricycles with a little bell ting-ting-ting-ing to tell you to bring out your tin cans, polystyrene and cardboard boxes. It must be dull work, and the pay is no doubt woeful. 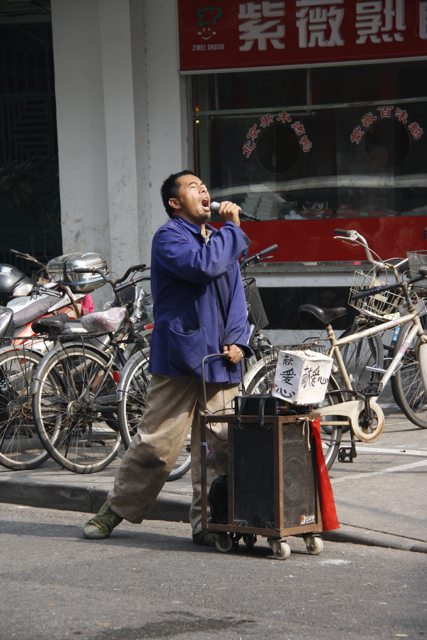 So this fellow has decided, every week, to ditch the tricycle for the morning and take up the microphone, to follow his dream of performing for an adoring public outside the doors to the wet market. OK, OK, so they're not adoring yet, and there isn't a collection box full of cash yet, but you know, this is just week two. He certainly sings his heart out and he has a lot of good John Farnham type moves. Look, I wish I could tell you he has enormous untapped singing potential, the new China Idol and all that, but without being too blunt, his singing, sadly, is crap. But he has passion. And I think if we could work some sequins into the outfit we'd really be on to something. It sure makes shopping for veggies a lot more interesting.